Originally posted: August 4, 2018 . Last modified: November 28, 2018 . Craving a pumpkin dish, but it’s still too hot outside? 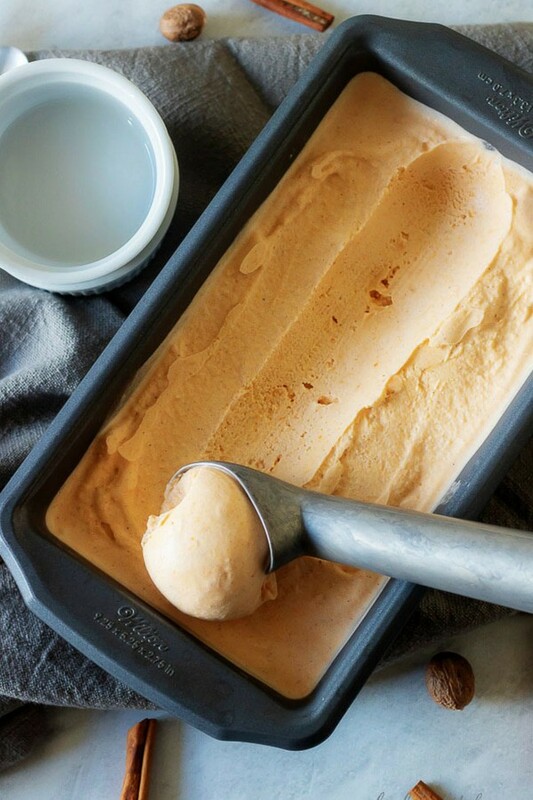 Then try our smooth and creamy pumpkin ice cream. All the flavor of pumpkin pie in a frozen dessert! For most of us, Summer is holding its reign; however, Fall is just around the corner. You know what that means, right? 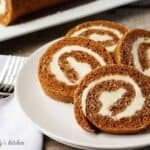 Pumpkin recipes! With that being said, it still seems a little early for muffins, pies, or tarts. So, Kim decided to make pumpkin ice cream for today’s recipe. I have to say, I was skeptical at first. Pumpkin can be tricky and its texture can easily ruin a delicate dish. Fortunately, that wasn’t the case for this pumpkin ice cream. 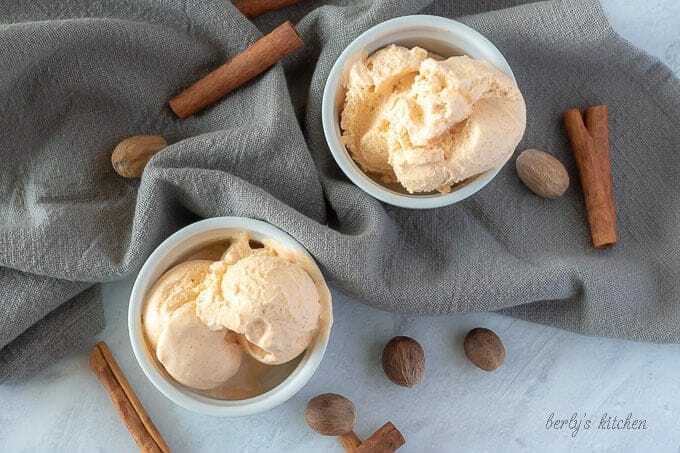 Kim used the perfect amount of canned pumpkin to create a wonderful flavor without the messing up the creamy texture of traditional ice cream. Let’s get started. First, start by gathering all your ingredients and get them ready to use for the pumpkin ice cream. 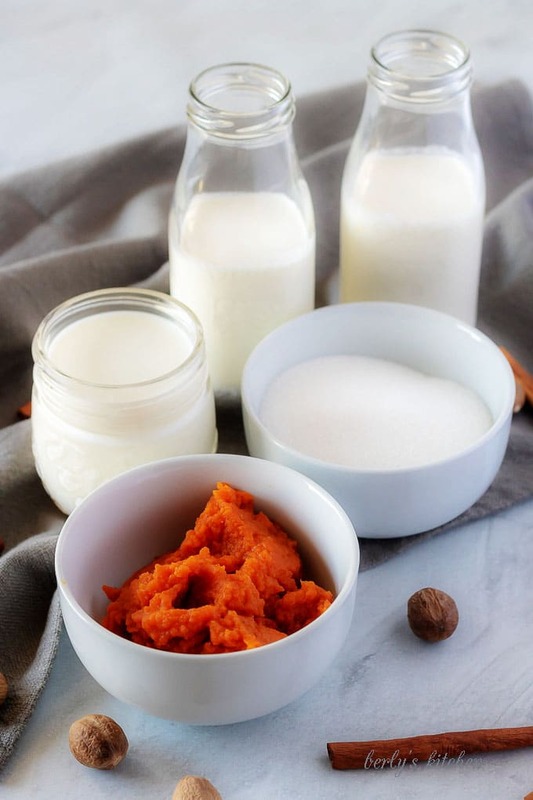 Once you’re ready, grab a large bowl or use the bowl of a stand mixer and add the heavy cream, milk, sugar, pumpkin puree, vanilla, pumpkin pie spice, and salt. 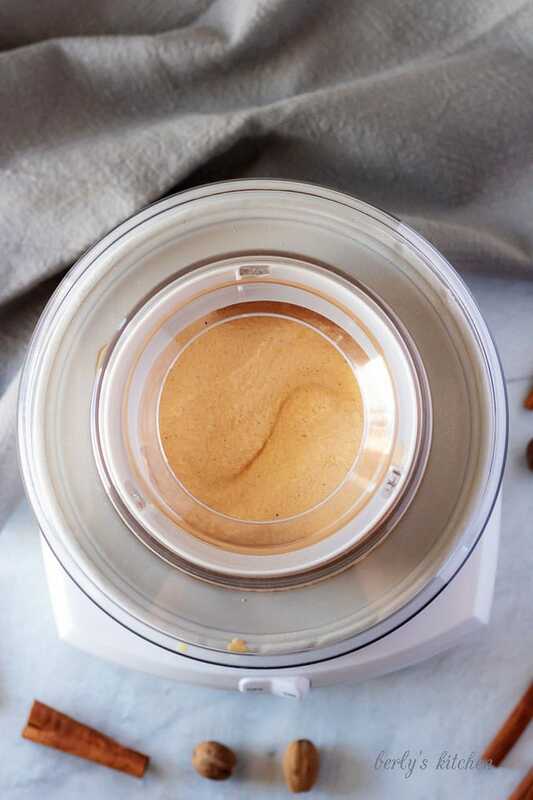 Next, use a whisk, or whisk attachment on your mixer, to whip the ingredients until well combined. Make sure the pumpkin puree, spice and extract are well incorporated with no lumps. 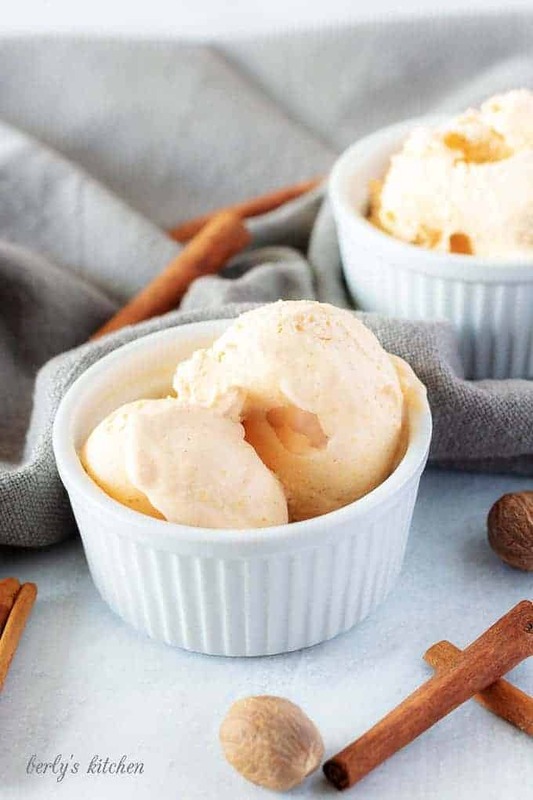 Otherwise, when the pumpkin ice cream is done, you could get a mouthful of spices in one bite. At this point, you’ll want to follow the manufacturer’s instructions for your particular ice cream machine. We chilled the mixture in the refrigerator for 1 to 2 hours, then transferred it directly to the frozen core of the ice cream machine. Now, after the ice cream churns in the machine per the manufacturer’s instructions, transfer the pumpkin ice cream to a freezer safe container and cover it with a layer of plastic wrap. Apply a lid to the dish and allow everything to freeze for 2 hours. Kim used a bread loaf pan for this recipe. Last, once the pumpkin ice cream has froze, remove it from the freezer for 15 minutes prior to serving. That’s it, the dish is completed. Kim let ours freeze overnight before taking the pictures the following day. As a result, she had to let it thaw out before it was ready to scoop and serve. 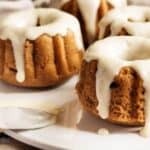 Feel free to garnish each serving with ground cinnamon or even a touch of pumpkin pie spice. Each ice cream maker has its own way for churning the ice cream base. Failure to follow those instructions could cause this recipe to fail. You were warned. When I make ice cream, I tend to use a Tupperware dish with a lid; but, I still put a layer of plastic wrap under the lid of the dish. It seems to keep ice crystals from forming on top of the ice cream. The pumpkin ice cream should be at the soft serve stage after one hour in the freezer. However, that depends on your ice cream maker, so once again, follow those instructions for success. We also have an ice cream for the coffee lover in you! 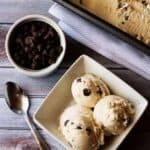 Take a look at our Homemade Coffee Ice Cream with Chocolate Chips. Craving a pumpkin dish, but it's still too hot outside? 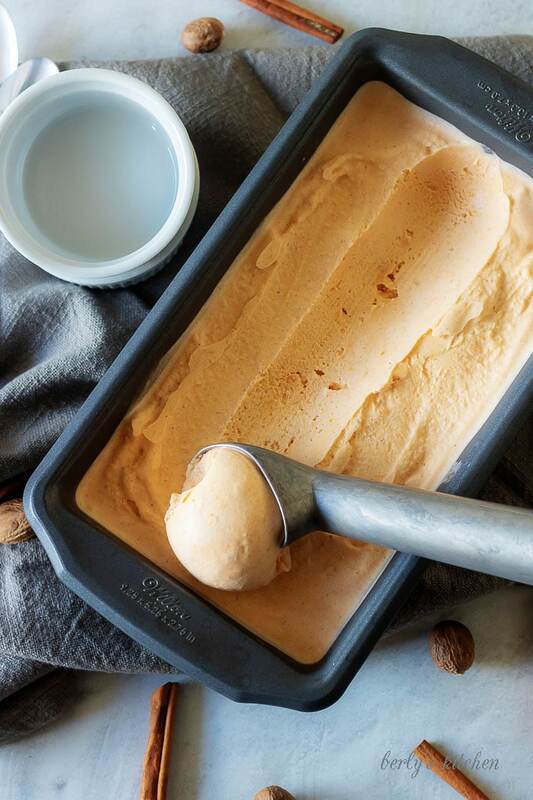 Then try our smooth and creamy pumpkin ice cream. All the flavor of pumpkin pie in a frozen dessert! First, in a large bowl or the bowl of a stand mixer, add the heavy cream, milk, sugar, pumpkin puree, vanilla, pumpkin pie spice, and salt. Next, use a whisk or whisk attachment to mix the ingredients until well combined. The pumpkin puree, spice and extract should be well incorporated with no lumps. Then, follow the manufacturer's instructions for your particular ice cream machine. We chilled the mixture in the refrigerator for 1 to 2 hours, then transferred it directly to the frozen core of the ice cream machine. After the ice cream churns in the machine per manufacturer’s instructions, transfer to a freezer safe container and cover with a layer of plastic wrap. Last, apply a lid and allow to freeze for 2 hours. Remove ice cream from the freezer for 15 minutes prior to serving. The calories listed are an approximation based on the ingredients and a serving size of 1/2-cup of pumpkin ice cream. Actual calories will vary. The ice cream can be stored in your fridge in a sealed container for up to 5-days. I love pumpkin ice cream but I ditched the ice cream maker at a garage sale about 10 years ago. Got it around 1994, used it a couple of times and then it took up space in the cupboard. Of course with hot days I kind of regret doing that, but I know if I get another, history will be repeating itself. 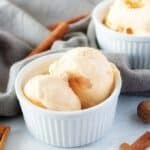 Great pictures of the pumpkin ice cream! Yum!